We’re sure you’ve tried or heard of them all — a spa treatment using essential oils derived from the most exotic flower or fruit in a country you never visited or heard of before. You leave feeling good and smelling great, but if you’re paying a pretty penny you want something to remember — not just a massage or facial with flowery or fruity ingredients. And if you’re making a trip to Sin City, these Las Vegas spas all offer something that’ll definitely be one for the memory books. As Tom from “Parks and Recreation” says, it’s that time to treat yo-self! Before you wine and dine your bod with wine-inspired treatments, spend some time at Spa Costa del Sur at South Point. Photo courtesy of South Point. Happy hour and weekend parties are great, but we need to celebrate our bodies, too. Most of us love wine, so why wouldn’t our faces love wine too? Costa del Sur Spa at South Point gets that. The 50-minute Rejuvenating Wine Facial uses the highest concentration of resveratrol, a plant compound known to have antioxidant vitamins that help restore the skin. When this is applied, you can actually feel the tingling during your facial. This service helps with dryness and restores that radiant glow we all miss having. At the end of your service, your therapist will hand you a card with a thorough skin diagnosis, as well as a summary of all the products used. This facial is $140. The 50-minute Olavie Chardonnay massage is another great way to toast, spa style. It starts with a full-body massage using Olavie’s Wine Therapy products infused with Chardonnay grape seed anti-aging extract. The massage relieves stress and your skin will be baby soft too. The massage is $115. These refreshing treatments are only available for the rest of October from Monday through Friday. We say it’s a great way to treat yourself before the crazy Halloween festivities. Why, hello Bellagio. Relax in this room before and after your water-inspired spa treament. Photo courtesy of Bellagio. 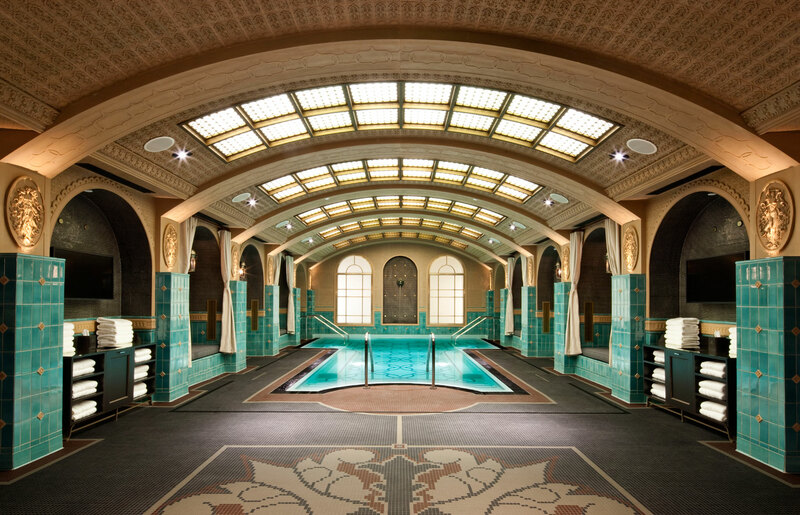 Pool season may be over (although there are a few pools still open), but at the Spa Bellagio you can float year round. The Watsu massage takes place in a private 94 degree pool. The warm water relaxes the muscles, while your therapist cradles you to support the spine. This allows the joints and muscles to be manipulated in ways that can’t be done on a massage table, explained Tiffanie Peterson, lead massage therapist at Spa Bellagio. 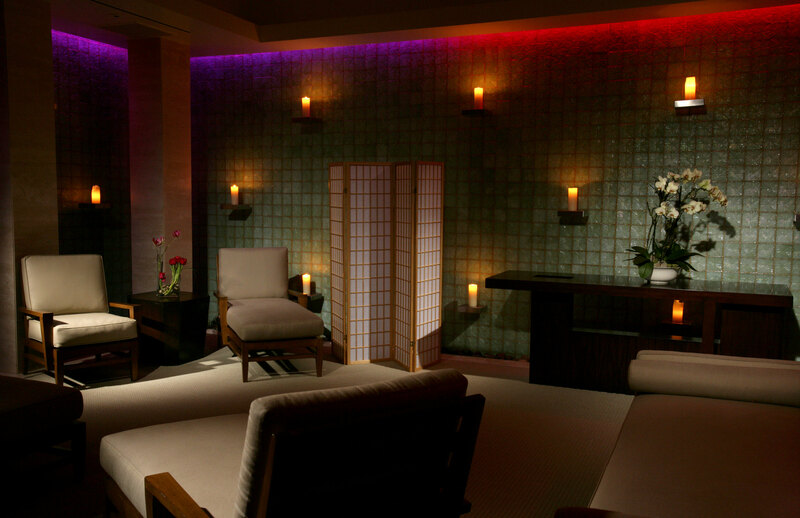 The 70-minute Watsu massage starts at $285. Speaking of water, another fun and unusual treatment is the spa’s Fountains of Bellagio massage. In this service, you’ll have two therapists working on your body, mirroring each other’s movements while using consistent pressure. “Our therapists have balanced the ebb and flow of the massage strokes to glide like water over the body in synchronization, creating a choreographed dance over the entire body that mimics the Fountains of Bellagio,” Peterson said. Since the Fountains of Bellagio has a number with Michael Jackson’s “Billie Jean,” might we suggest a tandem-style moonwalk back massage? That sounds so awesome right now. This 50-minute massage starts at $350. A 30-minute upgrade is available for an extra fee. We’re digging the view. Photo courtesy of Mandarin Oriental. Many spas draw inspiration from ancient Far East rituals. Mandarin Oriental’s spa is one of them. If you’re a yoga buff (or want to be), the spa’s Table Thai Yoga Massage will send you to that peaceful state quickly. This massage incorporates techniques of gentle rocking, rhythmic acupressure, compression and assisted stretching. You’ll be on a comfortable adjustable table, which allows for a greater range of motion during the stretching portion. The service is designed to boost your overall health and vitality while increasing circulation and flexibility. The massage is available in 60 or 90-minute sessions, starting at $180 and $220, respectively. Call (702) 590-8886 for more details. We’re ready to rock ‘n relax at Reliquary Spa. Photo courtesy of Hard Rock. Rock ‘n’ roll-inspired services are sure to get you rock ‘n’ relaxin’ in no time. Hard Rock Hotel’s Reliquary Spa has a list of fun treatment names — so fun that you’ll want to go just from the names alone. The spa’s signature Drum Sticks Reliquary uses bamboo reeds for drumming, tapping and rolling to rebalance your body’s energy flow, all while working deep within the muscles and trigger points. Choose from 50 minutes ($165) or 80 minutes ($225). Reliquary’s other signature service, Harmonic Reliquary signature service is all about sound. During this treatment, sound is used to soothe, invigorate and inspire you. Sounds like what (good) music does for us already, right? Just imagine how awesome it feels physically. The massage incorporates sound vibrations drawing from the art of acupuncture. The 80-minute service is $225. You can buy diamonds or let the diamonds find their way to you at this luxurious spa. Photo courtesy of the Trump International Hotel. Find your balance, or find your…diamonds? 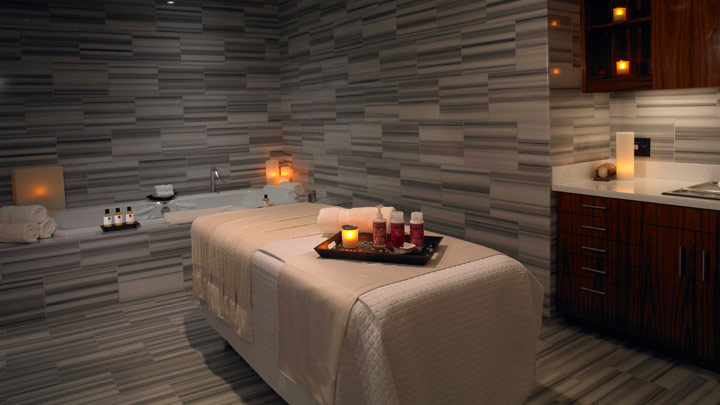 In this Find Your Balance service at the Spa at Trump, you’ll have both. This service purifies your body and mind by helping to eliminate electromagnetic pollution and daily stress. You’ll start with a luminous mud mask combined with diamond dust (ooooh!). Your spa therapist will use magnetic tools to remove the toxins in your body. It also includes a relaxing full body massage. Who’s ready to release all that tension and leave all sparkly? (Both hands go up.) The 90-minute massage is $270. This IV treatment will leave you feeling grrreat! You can always trick your friends by donning a hospital gown in pictures. Photo courtesy of REVIV. We’ve all experienced those moments of partying ’til the sun came up, then waking up and vowing never to drink again. You’ve tried everything – Bloody Mary cocktails, antacids and carb-laden food. Sometimes, even those aren’t enough. REVIV helps put back that pep in your step, but you have to be open to try something really different. REVIV’s treatments can help with everything from hangovers and exhaustion to dehydration. And if you plan on partying while you’re in town, we’re going to guess you’ll have all three. If you aren’t afraid of needles, you can go for an IV treatment (which takes less than an hour) or a booster shot (which only takes a few seconds). If you’re going for the IV treatment, you can kick back in a massage chair and catch up on Netflix or social media on your phone. A popular treatment is the Royal Flush Infusion, designed to rehydrate and re-energize in no time. It’s also said to boost your immune system, decrease inflammation, relieve pain and nausea and detoxify your body. Exclusively for hangovers, the ULTRAVIV is your best bet. You’ll get an anti-nausea medication, pain reliever, an energy booster and vitamin B-12, which helps increase red blood cell production, regulate sleep, mood and appetite and also boosts immune system. The spa is owned by emergency room physicians, so you don’t have to worry about things being sketchy or unsanitary. If IV treatments freak you out, the B-12 booster shots are quicker and you’ll still feel way better after that wild night. For specific prices, call (702) 644-4446. 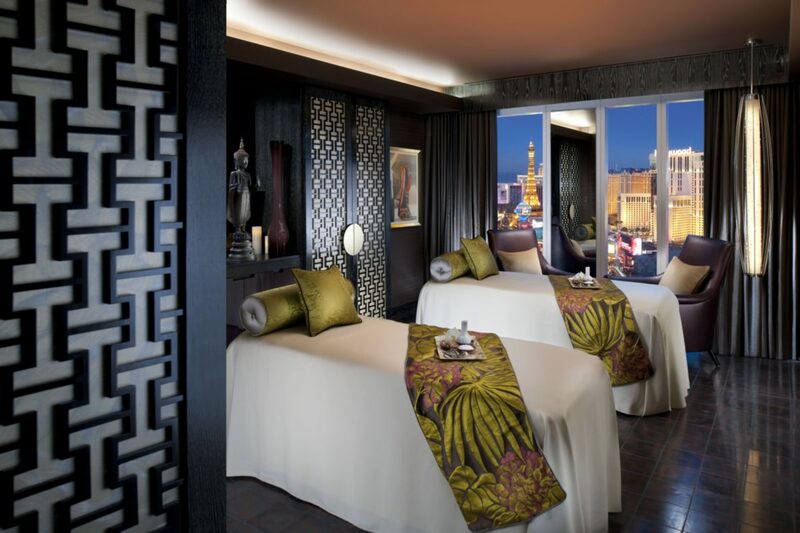 You can check out more of our Las Vegas spas for your super-special pampered day. And we’ll tell you again: Treat yo-self!